Leave it to the employers, and they will import cheaply the skills needed to build the capital's big projects – leaving local youngsters out of work. London's building, but who's building it? Any city has to have a dynamic existence that enables its people to live: be housed; travel; work; obtain healthcare; partake of leisure and trade. London, existing for 2000 years – bombed, burnt and ravaged by disease – has been one of the most successful in rebuilding and regenerating itself through the skills of its citizens. 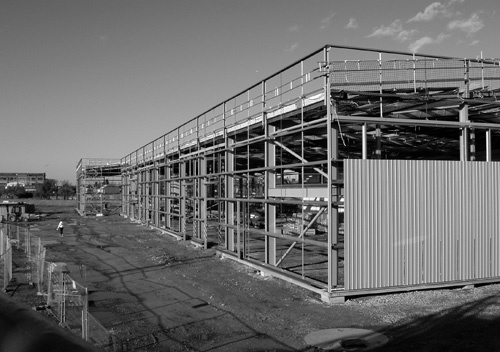 Construction site, Leyton, East London – across the road from the new high-speed link from Stratford to St. Pancras. Love it or loathe it, that process continues today. Survey the London skyline from any South London vantage point and from Battersea in the west to Canary Wharf in the east, and the activity in the construction industry is there to see. Cranes portend the rise of new towers; old stalwarts like the Battersea power station are getting the makeover treatment. The lower Lea Valley will shortly become the Olympic village. London Bridge will be the site of the 1016-foot high "Glass Shard" with a new station beneath. St. Pancras will soon be receiving its new high-speed euro services – two hours to Paris, via the Channel Tunnel Rail Link. If the Mayor gets his way – and the chances are he will – then an even more ambitious tunnelling project than the Stratford/St. Pancras link will start next year: the Crossrail project. Driving under the heart of the city from beyond the western suburbs to the fringes of Kent, the Crossrail transit system will enable large numbers of Londoners to cross the city to Heathrow and beyond in record times. Infrastructure projects such as those listed will employ tens of thousands of Londoners for the next five or six years. Additionally, speculative building projects – regeneration schemes such as the enormous Elephant and Castle rebuild along with the Heathrow extensions and King's Cross development – will provide thousands of jobs. SOME 30,000 new dwellings every year are needed to reduce overcrowding and poor housing in London and to keep up with the growth in population. The Thames Gateway with over 104,000 homes is planned for the East. All the above need servicing with water and sewerage. Major investment that can't be met by private water companies on their past track records – could be a vision of hell! All this on top of the estates and private housing repairs is crucial to London's future and the future jobs of its workers. Over 200,000 workers are presently employed in construction in London. More still are employed in related infrastructure maintenance and repair. Should the Thames Gateway ever happen, then even more jobs will be created. Beyond the sheer number of jobs – actually only one-sixth of those employed in business services (1.2 million) – the skills of those in the construction trades are vital to us as a class. The specific skills of architects and civil engineers, plumbing, brick laying, carpentry, plastering etc are central to any nation's ability to physically regenerate the built environment and create anew the shelter we require to exist. We keep those skills by keeping them employed. We may cavil at some of the idiocy of speculative building and despise the greed of rapacious landlordism. Nevertheless the growing need for homes and the burgeoning population of the capital require us, as a class, to take the future of the city seriously. We need to be clear on what we should keep and what needs to go. We should be clear about the need to organise in construction. The London building industry in its entirety is worth £8 billion. In recent years the employers have done very well, with productivity rising since the early 1990s. At that time, 300,000 workers employed in construction produced less than what 200,000 do nowadays. Crossrail will account for 5 per cent of Britain's gross expenditure on construction. Thames Gateway Bridge, linking the north and south banks of Thames beyond Woolwich. East London Line extension, linking East London with Crystal Palace in Southeast London. New docking facilities along the Thames to encourage commuting by boat. Docklands Light Railway expansion with new stations between Canning Town and Stratford. "Jet" trains from St. Pancras to Stratford in 7 minutes. The proportion of self-employed workers remains the same at about 45 per cent. Such workers remain largely employed in refurbishment and repair work. Employees of large firms employing over 150 workers tend to work in large-scale infrastructure projects such as transport schemes, the Olympics, the Dome. Medium-sized firms usually have a foot in both camps. The value of work done against the number of workers shows that output per worker in large-scale enterprises is worth £141,000; in medium firms £128,400 and in small firms £44,250. Large-scale new projects are where the big money is as far as employers are concerned. High value-added industrial companies will still need London premises and are likely to increase even though manufacturing jobs will probably see a reduction of about 80,000 by 2016; business service occupation is scheduled to increase under the London Plan and wholesale and retail warehousing will increase as well. With employers acknowledging skills shortages in London (although not universally) one would expect wage rates to be relatively high, but this is not the case. While skilled construction workers can earn more than elsewhere in the country – £500 gross a week – (hence the lure of London) this is still 23 per cent below the average for skilled workers in other London occupations. There is a major need for workers to press the Construction Industry Training Board and the Learning Skills Council to get to grips with training – above all for the Mayor's new training powers to be put to use in creating construction skills for the future at all levels. Otherwise, gaps will be filled from abroad. This will leave London youngsters without the wherewithal to enter the industry, thus adding to the already high levels of both unemployment and pitting workers here against migrants from abroad. Anecdotal evidence of large levels of employment of immigrant labour are not borne out by official statistics – but then the government refuses to collect information about who comes in from the EU, and on its own admission knows nothing about illegal immigrants. Retail, catering and public services take a higher share. Permission to build should be closely tied to rules about employment opportunities. New housing to accommodate athletes. New stadia for athletics, football, indoor sports and swimming. New transport links including upgrade of Jubilee Line trains (albeit imports from Spain). For example, the original bid for the Olympics had a built-in requirement to take on unemployed workers from the East End if there could be a skills match. However, out of the first 700 jobs only about 70 went to workers who met the locality criteria. We have to be sharper, especially as not all job forecasts show construction employment rising forever. Indeed, as projects like the Olympics, Crossrail and Heathrow Terminal 5 go past their completion dates 2012/2016, then, unless new schemes come on stream, some forecasts indicate up to 50,000 jobs being lost. We can't allow that to happen – new schemes are needed aplenty if London is to remain the pre-eminent city it is. The Tube needs massive refurbishment, especially if the Public–Private Partnership foisted on the Underground continues to foul up and frustrate all of us who use the Underground every day. The North–South rail links projected on the Thameslink, the East London line extension, the DLR extension to Woolwich, and the new tram systems projected for South London, are all essential to reduce the grind of getting to and from work. With London projected to increase overall employment to just over 5 million jobs by 2015, there's going to be an additional 800,000 people moving around the capital in 10 years' time. Londoners are going to need more housing as the population is forecast to continue to grow – it's already over 8 million again and we know not everyone's counted. We should not accept the overcrowding that many Londoners face. Again, we will need the skills to fulfil the London Plan of 2004.